CDC emergers are perhaps one of the most versatile flies a fly-fisher can use. CDC flies can be fished as emerging caddis, midges, may flies or ants. For tiers that struggle with small flies or finding enough small hackle CDC is a real benefit because the material can be cut to size. Another big benefit is that the material is very inexpensive.....a package of 50-75 feathers runs about $2.00. 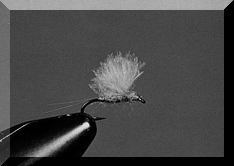 Try finding a neck with 4 dozen size 20-22 hackles and you can see why this material has become so popular. Working with CDC is fairly easy. To wing a fly, the tier may either strip fibers from the feather by stroking the fibers so that they extend at right angles and then stripping them off or the tier may align the tips of two feathers and tie them in as a wing. While the use of CDC material is quite new in the US, CDC has been used in Europe for quite some time. 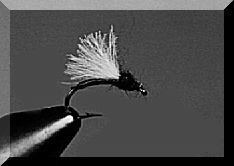 Early Swiss flies were called Moustiques and were very crude flies tied with silk, a split tail and a big glob of CDC for the wing. The French also used CDC in many early patterns. Shane Stalcup is a very innovative tier from Colorado. Shane credits tiers such as John Betts, AK Best, Tim England and Mike Tucker as some of his influences. 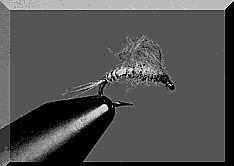 This pattern is unique in that the wing is formed by tying a loose loop of CDC over the throax after tying the body, which is then tied off at the head. These are a couple of really simple flies I use. Basically you just use a little thread, dubbing and a wing. To make an ant use a regular hook, make a small hump of dubbing, tie in a wing, cut it short and dub another small ball of dubbing. 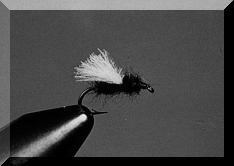 This fly is actually a dun mayfly but it can be fished as an emerger. 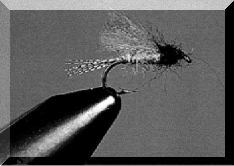 The fly can be tied in almost any smaller size and color. Olives, yellow and gray are good bets for this one. To make the wing, begin by tying in as a trude (or down wing) and make several wraps around the feathers to upright. (Hint: think of forming a parachute wing).